Republican presidential candidate Sen. Marco Rubio missed a Senate vote that advanced the Every Student Succeeds Act (ESSA), a conference bill that is poised to replace the federal No Child Left Behind (NCLB) law. The legislation was advanced in the Senate by a vote of 84-12. The GOP 2016 contenders who voted against advancing the bill are Sens. Ted Cruz and Rand Paul. Republican presidential candidate Sen. Lindsey Graham and Democrat presidential candidate Sen. Bernie Sanders also did not show up for the vote. The final vote on the bill is expected Wednesday and President Obama has said he will sign it into law. Sen. Lamar Alexander, who chairs the Senate committee that oversees education, and ranking member Sen. Patty Murray congratulated each other numerous times on the floor of the Senate for completing the 1,061-page “bipartisan” conference legislation, much of which was apparently crafted behind closed doors and passed by the House last week after having been published for review only two days earlier. Alexander said his legislation will prohibit the federal government from coercing states into using the Common Core standards. However, Ze’ev Wurman, former senior policy adviser for the U.S. Department of Education under President George W. Bush, tells Breitbart News the ESSA does little – if anything at all – to eliminate Common Core. Like NCLB, the ESSA still requires annual testing in grades 3-8 and then again in high school. It makes some sense for annual testing if one wants to create somewhat reliable trajectories of students to full proficiency, or if one wants to use the annual scores to create “growth” scores, so teachers’ added value can be measured. But ESSA gave up on getting all students to proficiency, and ESSA gave up on any kind of teacher accountability based on students’ scores. In that case, who needs annual testing with all the inevitable teaching-to-the test? That is, besides testing companies like Achieve, Pearson, and the like. What’s wrong with grade-span testing, say once in 3-5, and once in 6-8? Also, if we don’t use test results for teacher evaluation, why the ESSA’s insistence that the test must be aligned with the curriculum? Now that teacher evaluation is dead, shouldn’t we at least get rid of this “alignment” monstrosity? 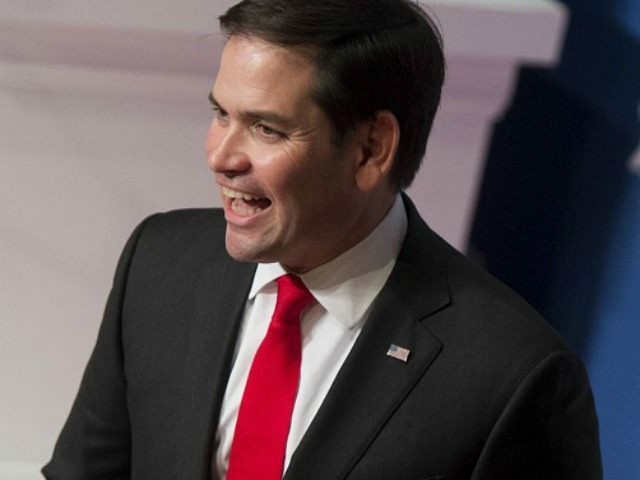 Rubio’s campaign did not respond to a request for comment by Breitbart News.